A perennial with trifoliate leaves, stems that root at the nodes, and white flowers. 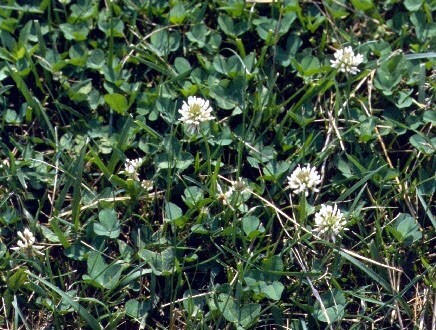 White clover is often planted in pasture and forage mixes but also occurs as a weed of lawns, turfgrass, landscapes, and orchards. 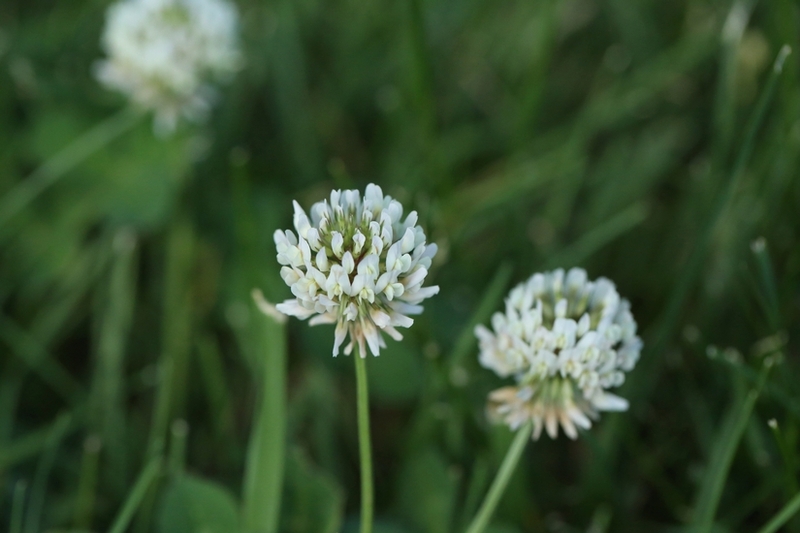 White clover is found throughout the United States. 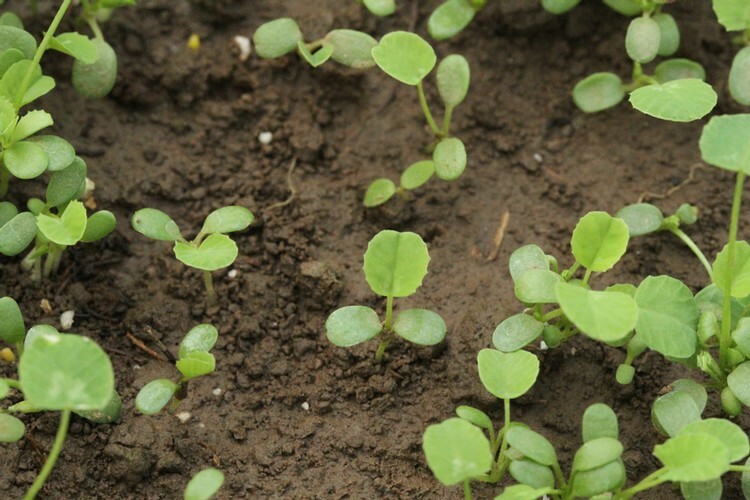 Cotyledons are spatula-shaped, 6 to 7 mm long, without hairs. The first true leaf is solitary, oval in shape, and cut off squarely at the base (truncate). 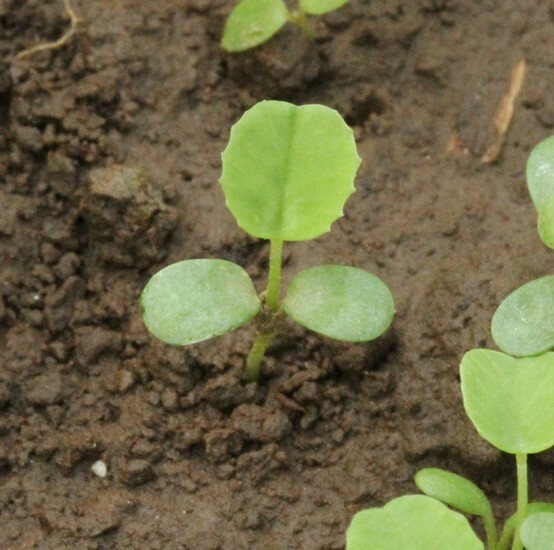 Subsequent leaves consist of three leaflets (trifoliate). Leaves are composed of 3 leaflets (trifoliate). Each leaflet is egg-shaped, widest at the apex, 1/2 to 1 1/4 inches long, and has an indentation at the apex. Leaflets usually have a lighter green or white "V-shaped" marking close to their base and a slightly toothed margin. Each trifoliate leaf occurs on a 1-3 inch petiole. Stems are low-growing, prostrate, usually without hairs but sometimes with short hairs, ranging from 4 to 16 inches in height. Stems root at the nodes. Occur on flower stalks (peduncles) that arise from the leaf axils. Each flower head is round or globular in outline, approximately 1/2 to 1 1/4 inches long, and consists of 20-40 individual white flowers. A pod known as a legume that is 4 to 5 mm long. A fibrous root system with stems that root at the nodes. 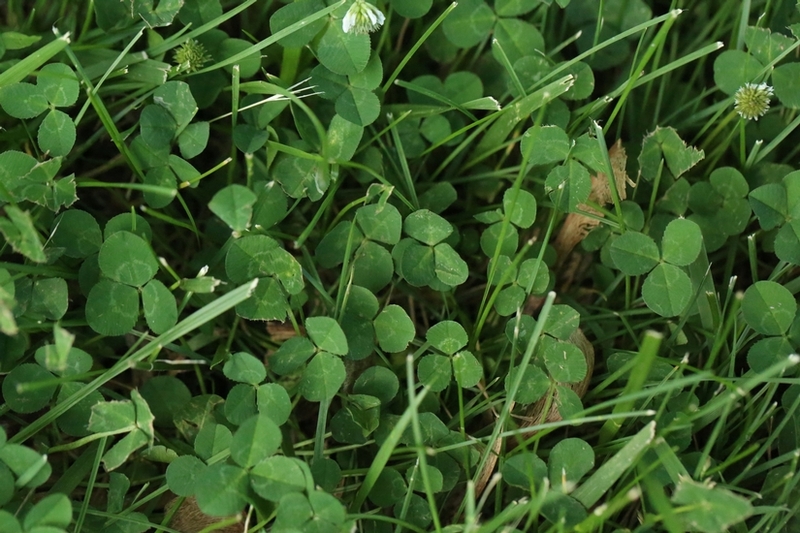 The trifoliate leaves and white flowers are both key features that help in the identification of white clover. 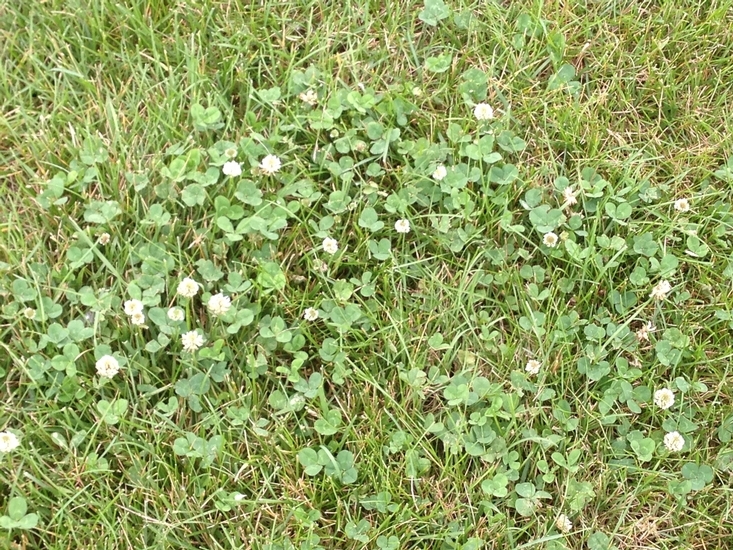 There are many other clover species that are planted in forages and occur as weeds. 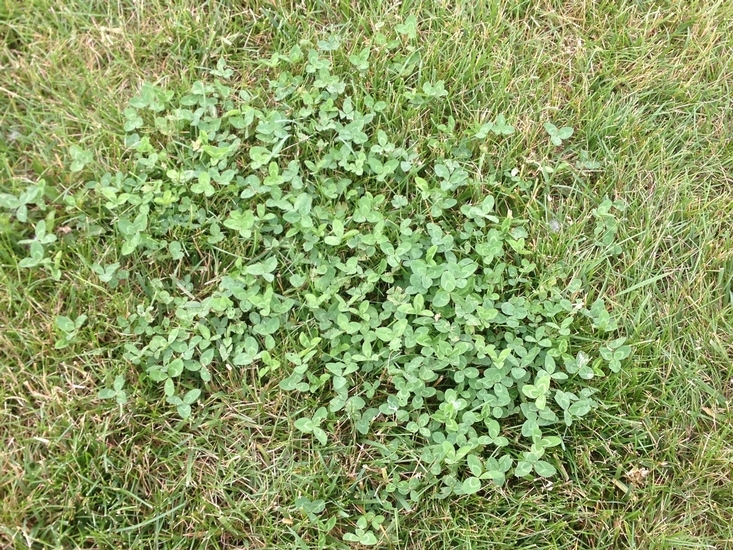 Red Clover (Trifolium pratense) is similar but is generally more upright and taller, has larger leaflets, and generally larger, pink to red flowers. 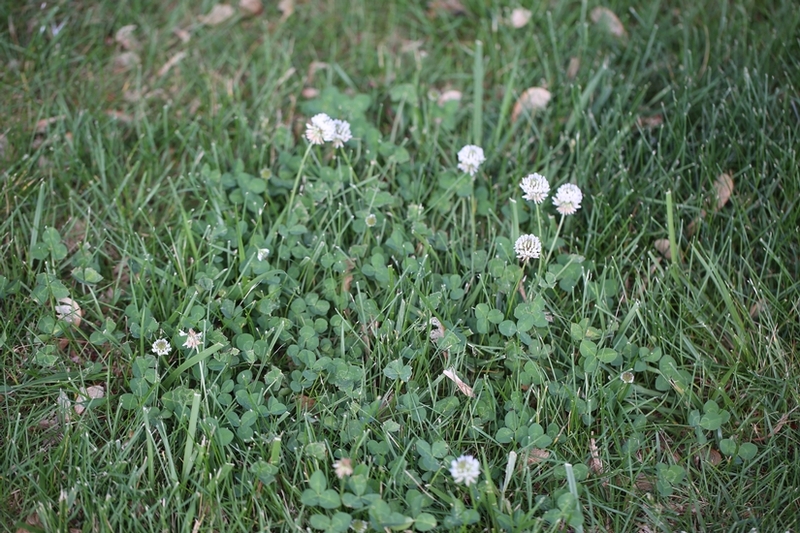 Alsike clover (Trifolium hybridum), also has white flowers, but may be distinguished from white clover by the more upright, clump-forming habit and larger, more elongated leaflets.